Crafted from 100% fine merino wool, this polo jumper exudes casual sophistication. 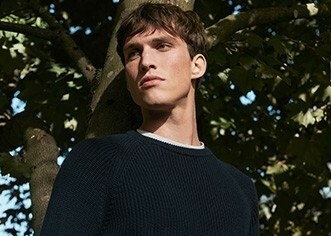 Knitted from Sunspel's unique Q13 fabric, a premium fine-gauge New Zealand merino wool which has been dyed after knitting to provide an exceptionally soft, luxurious feel. Try layering it over a crisp white tee, a pair of vintage Levi's 501s and accessorising with a tartan cashmere scarf. Chest 33-34" 35-36" 37-38" 39-40" 41-42" 43-44" 45-46"